The designers at Bassett have captured the natural beauty and character of authentic, handcrafted hard wood paired perfectly with luxurious upholstery with our line of accent benches. Ideal for living room or dining room seating, our benches are built to last. They’re great for family get-togethers and are made to last so they’ll hold up for years to come. Through our custom design program, you can design and upholster according to your decorating style. Create the look that fits perfectly with your existing decor or make your bench a focal point by adding your particular flair and aesthetic. Either way, you can count on the superb craftsmanship and durability that has made Bassett a household name since 1902. Visit a Bassett store location near you and browse through our showroom. 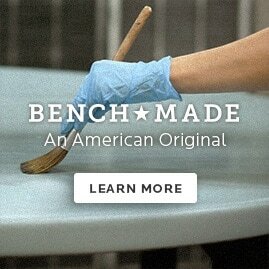 Check out the latest looks in handcrafted tables and benches. Then, when you’re ready to put your designer’s hat on, book an appointment with a Bassett design consultant. Together, let’s make your next family heirloom.